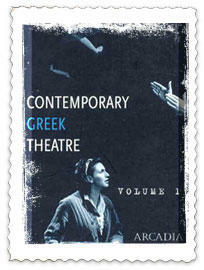 This is the first ever publication of contemporary Greek plays translated into English. The aim is to make contemporary Greek theatre accessible to international artists and audiences. The Parade by Loula Anagnostaki, translated by Anastasia Revi and Yiorgos Glastras. This one act play is part of the trilogy “The City”, 1965, and one of the classic modern Greek plays by Greece’s most prominent female authors. It is also the first contemporary Greek play performed in the UK. Love Thriller by G. Skourtis, translated by Aphroditi Panagiotakou, was first staged in Athens in 1998. It is the story of a married couple who thought they knew each other well. With Power from Kifissia by D. Kehaidis & E. Haviara, translated by Nelli Karra was first staged in Athens in 1995, and is considered to be the best Greek comedy of the decade. It was first staged in London in 2001.